Randy Maiers has been the President & CEO of the Community Foundation of St. Clair County since 2002. The foundation has approximately $75 million in assets under management, including the region’s largest public art center; a long-term residence for teens; a shopping mall courtyard, and the Blue Water River Walk. The Foundation has a heavy emphasis on leadership, placemaking and community prosperity. 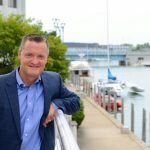 Prior to coming to St. Clair County Randy was the director of an education foundation in Metro Detroit, where he oversaw grant programs targeting engineering education at colleges and universities throughout North America. Randy is a graduate of Eastern Michigan University, and after a few years in Los Angeles following college, he began his career in nonprofit management in 1990 when he joined the staff of the Michigan Art-Train in Ann Arbor. He also spent several years with the American Heart Association until he took his first foundation job in 1997.